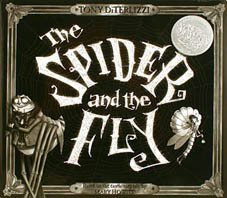 In this title, illustrator Tony DiTerlizzi gives The Spider and the Fly (Mary Howitt's popular 1829 poem) a luminous, 1920s classic Hollywood look, and the result is fabulous. In fact, this book was a Caldecott Honor Book in 2003, and an American Library Association Notable Children's Book. The poem remains the same ("Will you walk into my parlor,' said the Spider to the Fly...") and teaches the same vital message about how kind words can sometimes be used to mask less-than-kind intentions. DiTerlizzi's silver and black illustrations raise this classic poem to a whole new level! He created the illustrations with gouache and pencil, then reproduced them in silver and black duotone, giving them an otherworldly feel. The result is very theatrical and luminous. This book works for a wide range of ages, and even those who have seen other versions of this classic poem will love this title. 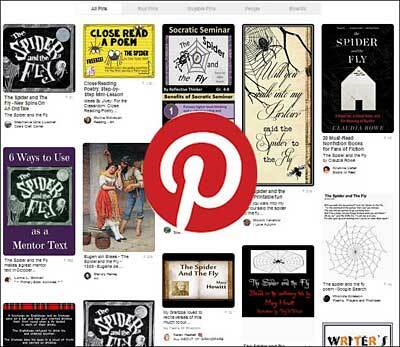 For added meaning, follow your read aloud with a discussion of the underlying message of the poem. We've found that many kids are so captivated by the art and the suspense that they miss this aspect entirely. Below are sample pages from inside this book. Although you can't tell in our little computer screen versions, the pages have a silvery luminescence that makes the illustrations all the more ghostly and fun. 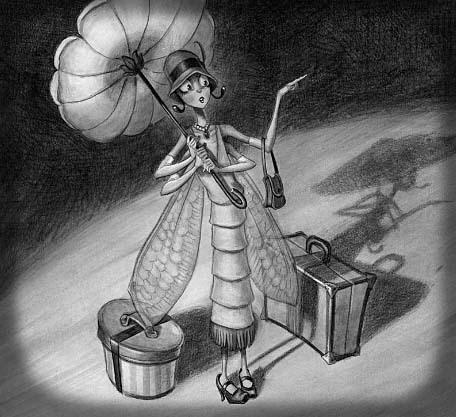 In this spread, the daintly little fly (so adorable in her little flapper-style 20s attire) is suspicious of the spider's invitation for her to take a little nap in his bed. As well she should be! This book works for a wide range of age levels. Younger kids love the storyline, but (in our experience) don't always get the underlying message. Older kids get the message, and find the presentation of it quite clever.